Keep on Rowland: Oh, Capri. 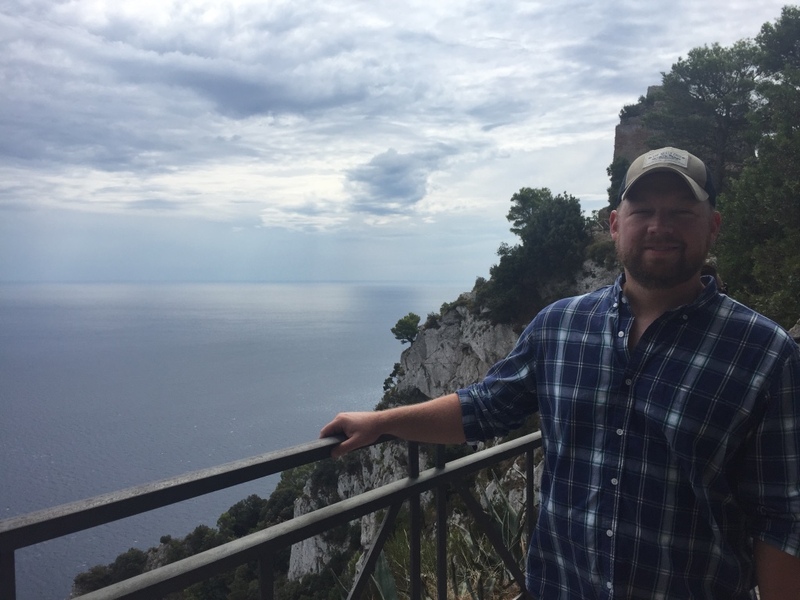 After our short stay in Naples, we took a ferry over to the island of Capri. This ferry ride took about an hour. 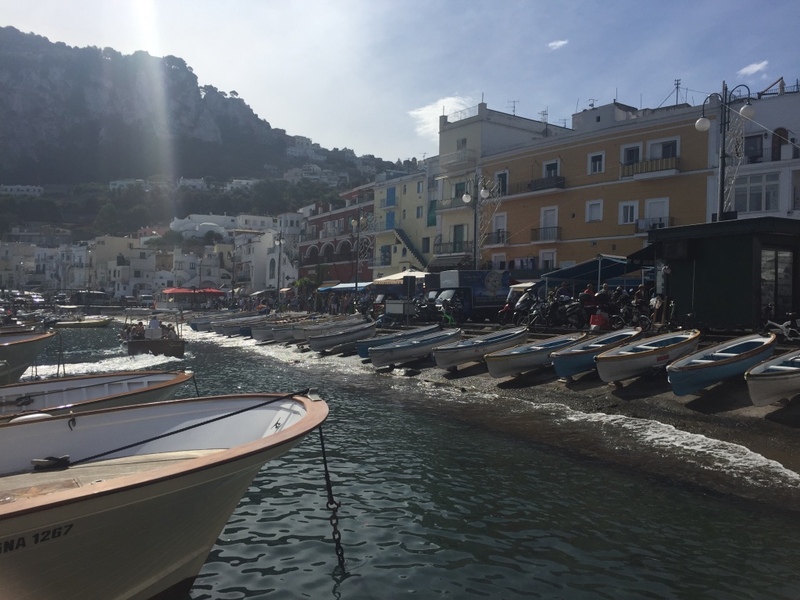 Capri was so interesting because it's an island with super steep dropoffs all around except for one small section called the Grand Marina. As we entered the Grand Marina we got to see one of the most gorgeous views. Gorgeous house built on the side of these steep hills and practically on top of one another-- all looking over the water. 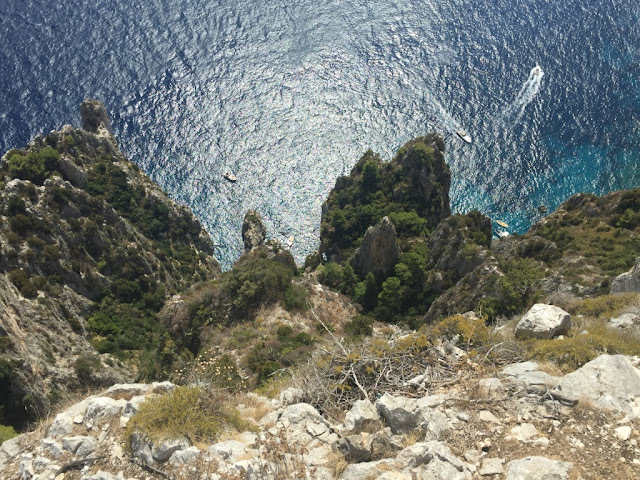 One of highest points of interest when getting on the island was seeing the Blue Grotto. Unfortunately, the tide was too high upon our arrival, so we didn't get to go out to the Blue Grotto. 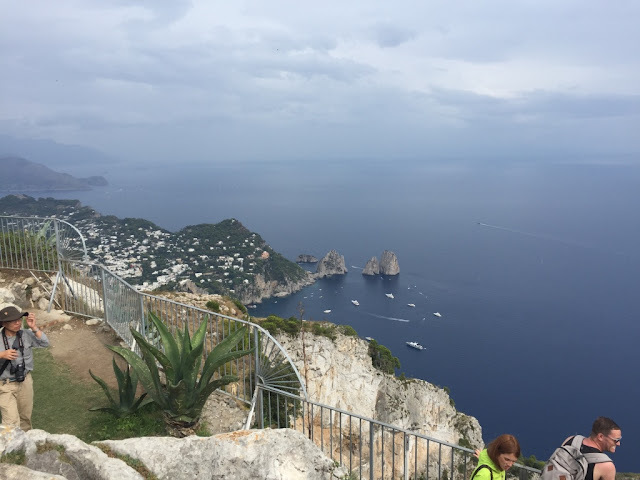 We did, however, get to take the FUNICULAR up to the main area of Capri. <<Go ahead, google what it is, while I sit here and act all cool like everyone knows what a funicular is. This EASILY became my new favorite word and I wish there were more instances in my everyday life where I could use it.>> I'll just go ahead and tell ya, its a cable car. 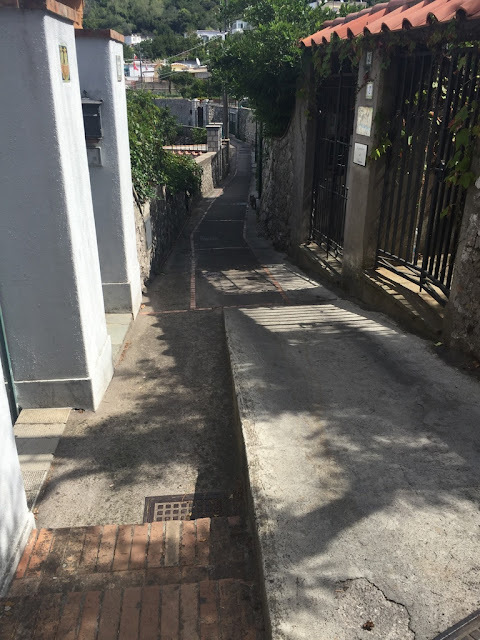 And it goes up the super steep side of the island to take you to the main two towns on the island-- Capri and Anacapri. 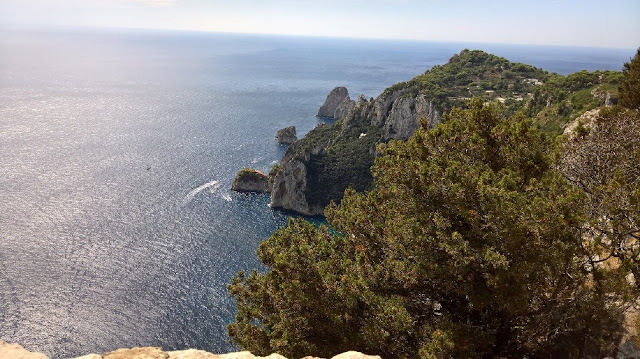 Once we got to Capri town we took a hike to Tiberius Palace, which was on a very high point of the island. 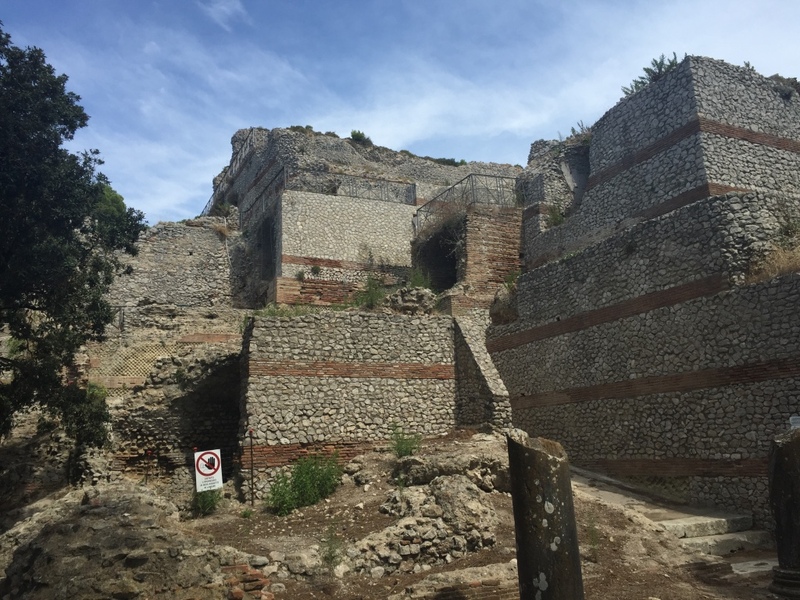 Not only was it neat to see the ruins of this palace, but the views from atop this part of the island was sickingly gorgeous. Look how steep this thing was!? And this was literally at every turn. This is why Tiberius bought this island for his palace-- It was easy to defend with such steep sides and only one port. Not only were the sights at the top great, but we saw some interesting sights on the road also. Are these the cutest or what? They just hung out and let me be their friends for as long as I wanted. walkways peppers with the cutest houses and doors you have ever seen. This was one of my favorites. 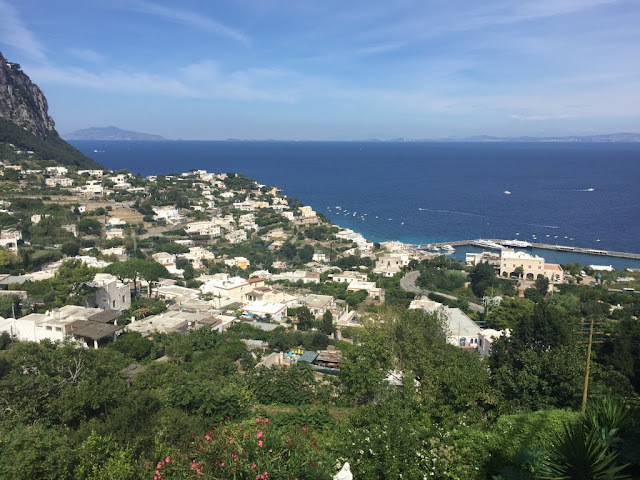 After venturing around Capri town, we took the bus to Anacapri. 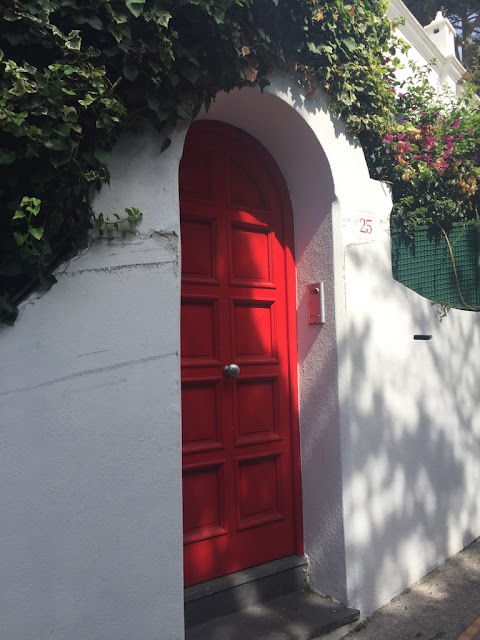 Anacapri is a smaller town on the island. Anacapri has a chairlift that will take you to the top of Mount of Sonora. The chairlift situation was an experience in and of itself. 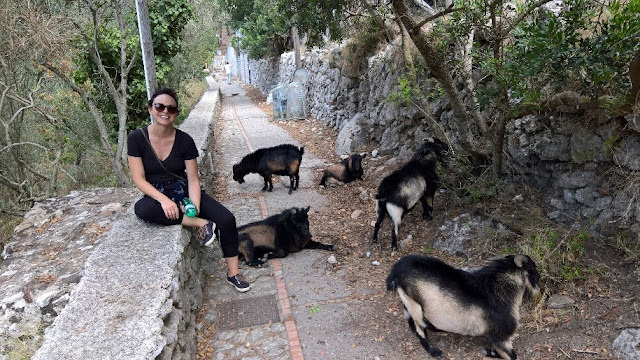 Not only was it a little tricky to mount and dismount, but there was practically nothing holding you in the seat-- it only added to the overall Italian experience of unsafety, but I didn't mind. Once at the top of Mount Sonora, the 360 views were just unbelievable. After our trekking around we make our way to our hotel which was near the Grand Marina. This was, by far, the most extreme hotel situation that either of us have ever been in. Upon arrival, the hotel manager brought us wet towels and water. She took our name and then immediately had us taken to our "welcoming reception" on the rooftop of the hotel. We were a tad confused on what to do, so we pretty much just followed her to the roof and politely accepted the wine and olive salad she provided. It was quite good and the view from the rooftop was wonderful. After our reception we went back down and were given a rundown about the island and the hotel, which was an 11 room boutique hotel over 100 years old. "Gaya" , a suited nice- looking Italian lady took us to our room and that's when things got really weird. She gave us an intense tour of our room-- showing us EVERY detail of everything--- pointing out every item in the fridge, every item in the bathroom, showing us how to work the air conditioner and TV. David and I were literally looking at each other like...."um.... is this real life?" But whatever, it was cute. And it was, by far, the most quality hotel stay I have ever had. <Poor Gaya didn't speak perfect English, thats for sure. On the elevator ride up, David asked her how many people lived on Capri and she confidently answered "Twenty Million." We both held our laughter-- We think she meant 20 thousand... although the world wide web says its more like 13,000. Regardless, it was so cute of her. Capri was precious. I'm so glad we carved out a day to explore.